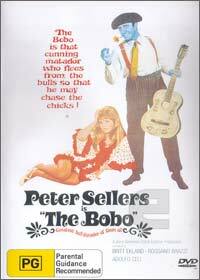 Before I start this review, the world once again needs to know that Peter Sellers was a comedic god among men and this movie, "The Bobo" is an almost forgotten Peter Sellers classic. The star of the movie is Juan Batista played by the talented Peter Sellers who arrives in Spain seeking fortune and glory. Unfortunately for Juan, his luck has run out but when he meets a theatre impresario, he is given the chance of employment if he can seduce Spain's most beautiful woman, played by the gorgeous Britt Ekland. The story features your traditional Peter Sellers stand-up and slapstick comedy that really makes this movie one of the forgotten greats that I would wholeheartedly recommend to any fan of Peter Sellers or for those that love the comedic genre of yesterday. Its comedy meets romance with an explosive reaction and one cannot help but be entertained from the energy that both Sellers and Ekland generate on screen.